Click the switch to close/open it. Here, the transformer is assumed to have (1) no flux leakage, and (2) no resistance in the two windings. The inductances of the two windings are NOT assumed to be infinite. However, we can assign some large inductances (but not infinite ) to them by selecting "Large winging inductances". Please note that it is pointless to compare the amplitude of a voltage and that of a current when they are dispalyed simultaneously on the screen. They have different units. The two coils are resistanceless. The primary coil behaves as a pure inductor. The only current flowing is the primary current (Ip). The flux linking the two coils is caused by Ip. This primary current is called magnetizing current (Ip,M). The primary voltage (Vp) leads the magnetizing current (Ip,M) by π/2. The secondary current (Is) becomes nonzero. 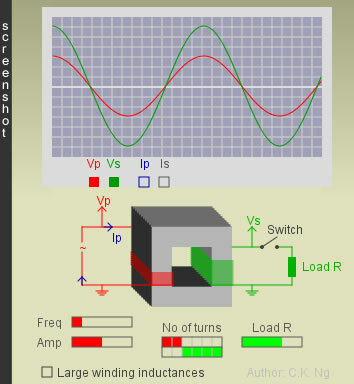 Is is always in phase with Vs, because the load is a pure resistor. The flux linking the two coils is still caused by Ip,M. Besides the manetizing current, the primary current has one more component (call it Ip,L), which is anti-phase with the secondary current Is, i.e., Ip = Ip,M + Ip,L, where Ip,M and Ip,L are π/2 out of phase. By Lenz’s law, Is must flow in a direction such that the change of magnetic flux in the core is reduced. However, the change of flux in the core always produces a voltage in the primary coil to have the same value as the a.c. source voltage (since the input loop is resistanceless). To maintain this, the primary current eventually becomes larger to restore the original magnetic flux, compensating the opposition due to the secondary current. Eventually, the core flux is still produced by Ip,M,while the fluxes produced by Ip,L and Is cancel each other out. The primary voltage (Vp) leads the primary current (Ip) by an angle θ = tan-1( R/Xs), where Xs is the reactance of the secondary coil. the phase angle between the primary voltage and the primary current will be further reduced, approaching zero. the primary voltage is (nearly) in-phase with the primary current. the current ratio Ip : Is = Ns : Np holds when, besides the transformer satisfying the above two assumptions, the resistance of the load R must be sufficiently small (R << Xs).